We are the largest undergraduate German program in New York State and the surrounding region. We offer a range of courses at the beginning, intermediate, and advanced levels. Our major and minor can easily be combined with other courses of study. We are proud to embody Hunter’s commitment to the liberal arts and to global education, and to serve unique and diverse students who bring a wide range of fascinating backgrounds to their German studies. We help them to access extraordinary cultural events, internships, and employment opportunities in the heart of our global city. For all beginning and intermediate courses, and many advanced courses as well, we use textbooks and online materials authored by our own faculty, many of which are provided to students at zero cost. We offer flexible and affordable study abroad programs during the summer and the academic year, supported by scholarships from the German state of Baden-Wurttemberg and from the Max Kade Foundation. We bring writers, actors, politicians, and other speakers to campus, and we visit local museums and cultural institutions together – often in conjunction with our popular, student-run German Club. Our students regularly intern at the German American Chamber of Commerce and the Museum of Jewish Heritage. Often these internships lead to part-time and full-time job offers. Our recent alumni have gone on to build their careers at the German American Chamber of Commerce, the German Consulate, the German Academic Exchange Service, and the Goethe-Institut New York. to create and propagate knowledge and understanding about German language, literature and culture and also about the teaching of German language, literature and culture locally, regionally, and nationally. The department offers courses in the language, literature, and culture of German-speaking countries that are designed and sequenced to guide students from their current language proficiency levels through well defined stages of proficiency in production and comprehension so that students will reach college-level literacy in German and excel in the field of German studies. 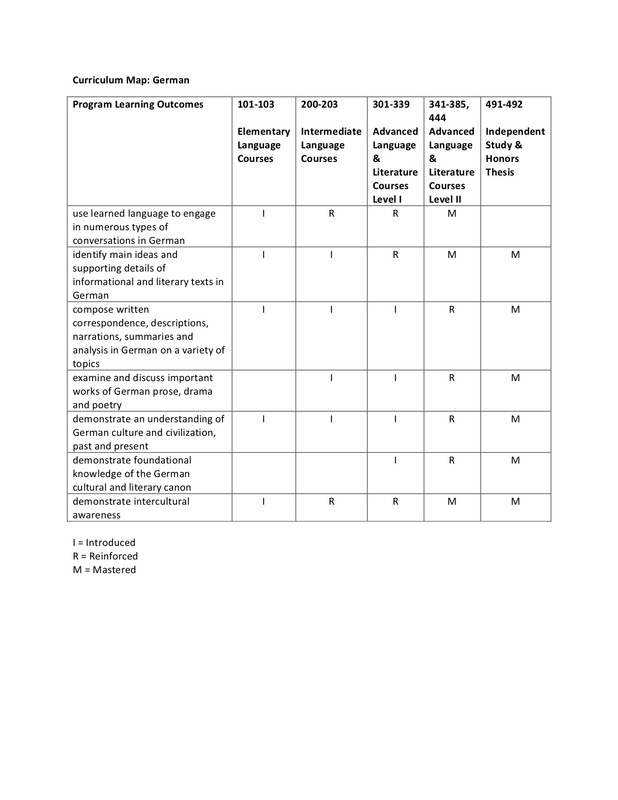 Please click here for our program learning outcomes and curriculum map. Students who complete the elementary and intermediate courses can expect to reach the ability to function in everyday situations in German-speaking environments and to have a solid base for the upper-level study of German language, literature and culture. Students who complete advanced language, literature, and culture courses will gain an understanding and appreciation of German culture and civilization, past and present; they will comprehend spoken and written German to the level of understanding the classics of German prose, drama, and poetry; and will either have reached or will be well on their way towards reaching the linguistic and cultural capacity for engaging in intellectual discourse in written and spoken German. In teaching and scholarship, faculty serve as mediators between the American and German-language cultures for the College, the University, and the wider community. They have a broad first-hand knowledge of German cultural texts, traditions, issues and trends so that they can support Hunter and CUNY students with diverse needs and interests relating to the language and cultures of German-speaking populations and countries and thus help to empower students in all walks of life and endeavors. The proficiency-testing system used in the department makes it possible to place students with prior knowledge of German at the level most appropriate to their linguistic and cultural needs and abilities.